Dr. Sheila Birth Wins Dallas/Fort Worth Mom Award! Each year, DFW Child magazine conducts a poll for readers to select “mom-approved” doctors in the North Texas area. Dr. Birth was selected as a 2015 Mom-Approved Orthodontist! 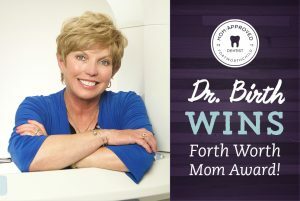 Look for her in the September issue of Fort Worth Child as a trusted, mom-to-mom referred orthodontist! Dr. Birth is so excited to have been chosen for this award and would like to thank all of her amazing patients.